DURHAM (WTVD) -- The Duke Blue Devils returned to their campus in Durham Tuesday afternoon for a welcome-home ceremony at their famed Cameron Indoor Stadium. The team plane touched down at RDU just after 2:30 p.m. Tuesday. The team received a hero's welcome on the tarmac in the form of a water cannon salute. Then, there was a huge celebration at Cameron at 5 p.m. The party capped a season in which the Blue Devils started as the preseason Atlantic Coast Conference favorite and a Final Four favorite, stumbled a bit through a bumpy few weeks in January, then surged down the stretch en route to a fifth NCAA championship with a 68-63 win against Wisconsin in Indianapolis. Coach Krzyzewski came home with his fifth national title, but at the party he heaped most of the praise onto his team of young, unselfish, self-motivated players. "I'm not trying to insult my other team," said Coach K. "This has been my favorite year." 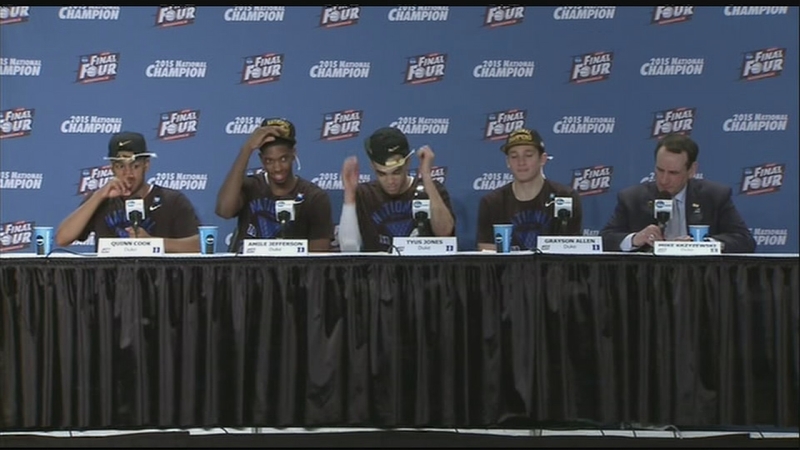 "These guys have made my senior year magical, magical," said guard Quinn Cook. Coach K summed up the season's ups and downs and managed to recap the year and stick it to Duke's arch rival all the same time. "We were getting beat by North Carolina (crowd boos)," said Coach K. "Look, today's not a day to get into that (crowd laughs). This is about national champions!" Monday night, Coach K stood beside the gleaming national championship trophy, and posing for the traditional, confetti-soaked photos. But when a photographer asked Krzyzewski to hold up five fingers, Duke's Hall of Fame coach declined. "No," Krzyzewski said, pointing at the crystal basketball sitting atop the trophy. "This is one win." It made sense. Krzyzewski has talked all season about not letting his players feel burdened by either his program's past successes or failures. Live in the moment, he told them. And in the end, it explained why he was more focused on winning his first title with this team than becoming the second coach to win five NCAA titles. "All of them are great," Krzyzewski said. "The one you're in this moment with is always the most current, you can feel it the best. I haven't loved a team any more than I've loved this team. We have eight guys, and four of them are freshmen. 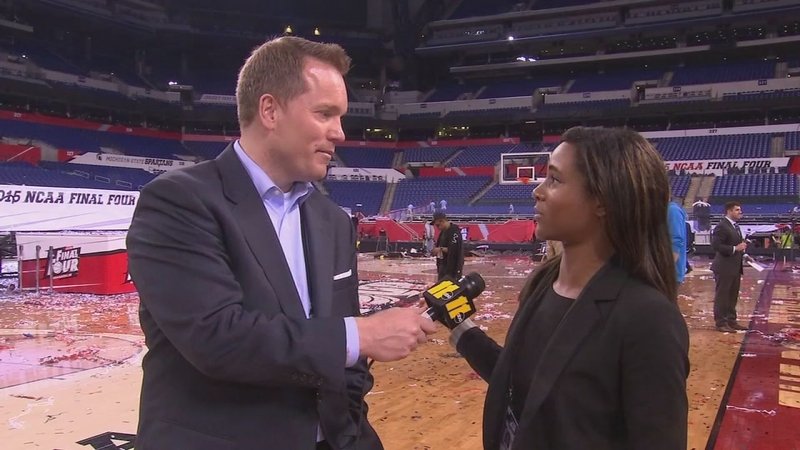 For them to win 35 games and win the national title is incredible." Duke has now won NCAA titles in 1991, 1992, 2001, 2010 and now, 2015. "It's hard to put it into words," said freshman point guard Tyus Jones, who was named the most outstanding player at the Final Four. "This is just such a special group. The best team I've ever been a part of. We've worked hard all year. This has been our one goal that we were working for." Duke ended the year with 18 wins in 19 games, the only loss coming to Notre Dame in the ACC Tournament semifinals in an off performance that Krzyzewski described as "an out-of-body experience." The Blue Devils responded by looking sharp throughout a six-game run through the NCAAs, most notably with a defense that held every opponent to 63 points or less. 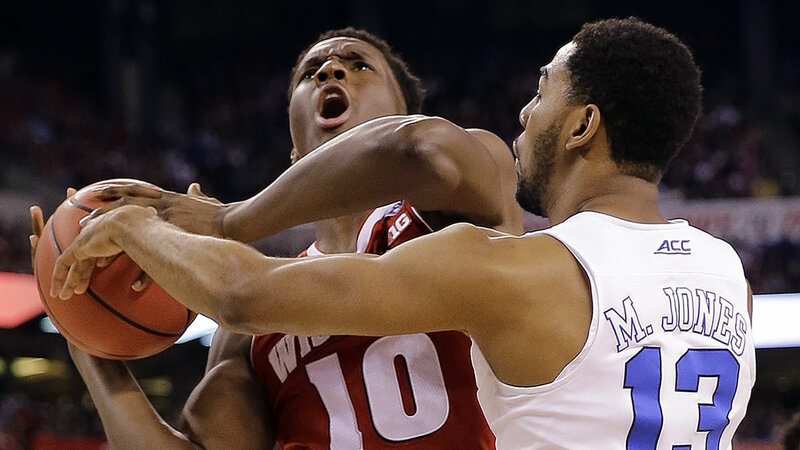 Coach K, and four players discuss Monday's win over Wisconsin. They did that with a roster of eight scholarship players, half being freshmen. And one of those, reserve Grayson Allen, turned in an unexpectedly huge performance that sparked Duke's rally from nine down midway through the second half against the Badgers. "It was all about the team," senior Quinn Cook said of the freshmen. "All of them worked. All of them looked to the upperclassmen for advice. They didn't think they knew it all and things like that. They worked. I mean, they worked hard. It paid off tonight." It's unclear if Jones, big man Jahlil Okafor and fellow freshman Justise Winslow will follow Cook out the door as one-and-done NBA prospects, and none of the three were ready to talk about their futures after Monday's game. Regardless, the 68-year-old Krzyzewski has another milestone - and moment - in a career full of them. "They've been a joy," Krzyzewski said. "They've been an incredible joy. When you're already happy, and you get happier, it's pretty damn good. It's pretty good." 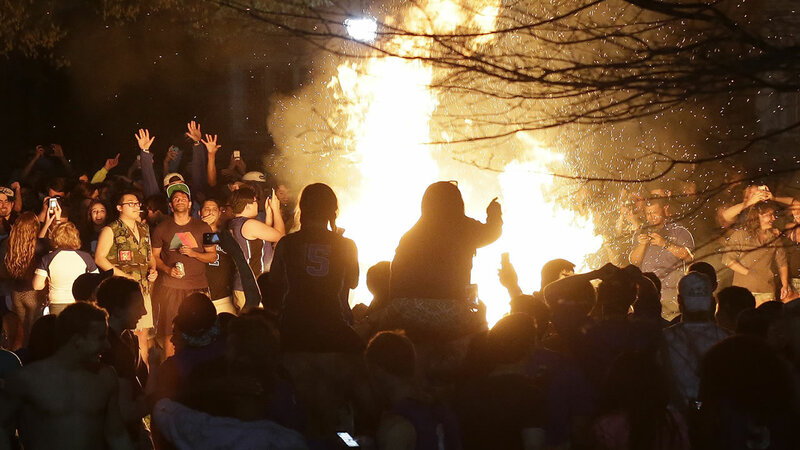 Duke fans and students gathered at a huge bonfire following Monday's win over Wisconsin for the NCAA national title.